What is QRIS? It’s Michelin stars for preschools. As consumers, we check ratings system before choosing a hotel or movie. State QRIS programs provide that same service for parents looking at early learning. It’s part of an effort to raise standards in early learning nationwide. Quality impacts learning outcomes. And parents are well aware that quality and educational content in early learning varies widely. But grading information is hard to find. They can ask questions, but generally they rely on word of mouth, online reviews and accreditation standards. Quality Rating and Improvement System (QRIS) is a rating or stars system to raise standards and create uniformity state-wide. QRIS is a national movement, but decisions on how to define quality and implementation is state by state. For instance, the Washington State QRIS is Early Achievers, the New York program is QUALITYstarsNY. QRIS influencers include the National Center on Early Childhood Quality Assurance, the BUILD Initiative, ChildCare Aware and others. NAEYC has a large amount of information on QRIS. QRIS programs are voluntary and levels of participation vary from state to state. It is frequently administered by a state’s human services or education agency in partnership with universities, who mainly do assessment. Furthermore, other organizations — like ChildCare Aware — provide training, coaching and support to early learning services. 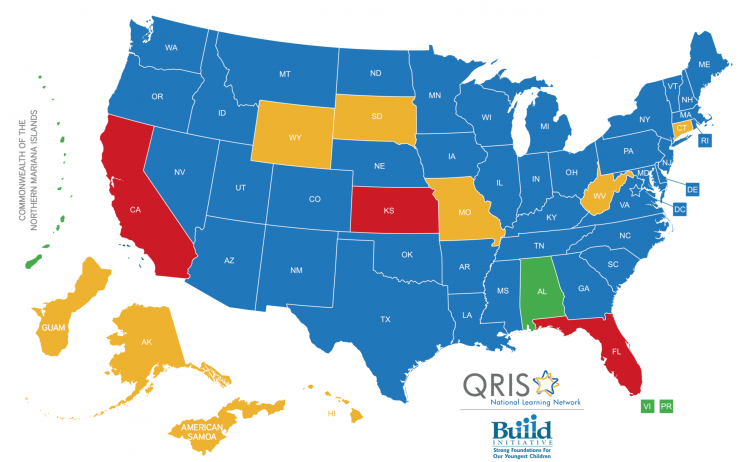 Find a link to the QRIS program in your state here. The system was first introduced in Oklahoma in 1997 and has evolved dramatically since then. The largest jump in participation occurred in 2013 when the federal Race to the Top-Early Learning Challenge grant program made QRIS participation a performance metric. Currently, 49 states, the District of Columbia, and many US territories are either planning, piloting or implementing a version of QRIS. Consequently, these early adopters focused on “raising the floor” of quality by building on child care licensing standards. mandating independent observations to determine the quality of the service. The latter has proved to be the most costly component of a QRIS program. How Effective Are QRIS Programs? It is difficult to judge the effectiveness of QRIS given the wide variability of programs across states. For instance, each state has its own approach to defining quality standards, providing incentives and disseminating information. In addition, outcomes such as school readiness are hard to measure. As a result, no consensus has been reached as to a single best QRIS design strategy. The research in this area has mixed results. One study in the journalScience “Can Rating Pre-K Programs Predict Student Outcome” looked at 700 preschools over a four year period. It concluded that the features QRIS programs look at — teacher qualifications and experience, classroom environment, family activities, and adult-child ratios—did not correlate with improved student learning outcomes. However, it seems unreasonable to conclude that the quality of early education has no bearing on learning outcomes. And so therefore, the folks in the QRIS movement are having to move forward without data, but confident that their work will help US educational outcomes. Directionally, QRIS programs all ask the right questions of early childhood education providers. And while some of the processes are unwieldy and bureaucratic, simple investments in technology can go a long way to meeting QRIS requirements while at the same time significantly improving service quietly and family communications. For a comprehensive list of resources by state checkout the Childcare Aware resources by state here.